After seven midweek league games without a win, AFC Dunstable finally got the monkey of their backs, as they registered their first victory to defeat Hertford Town 2-0 on Wednesday night. 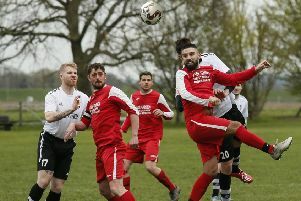 The result saw AFC climb to second place in the table, although they had to make changes from the weekend, with Jamie Warne and Chris Francis missing out, so Wayne Mills and Leon Simpson came in. AFC should have taken the lead in the first five minutes when Fabio Bufano had a gilt edged chance from close range, but his shot over the bar. Hertford responded straight away as Louis Porcelli had to make a good save, while the visitors looked dangerous as they continued to threaten. In the second period, Tegana James hit the bar for Hertford, but AFC dug deep and broke the deadlock on the hour mark as centre half Leon Cashman found himself on the left wing, where he crossed for Jermaine Hall to score. The goal seemed to knock the stuffing out of Hertford as Hall continued to cause problems with his movement, while Simpson was replaced by Enzo Silvestri with 20 minutes to go. The sub was to have quite an impact as he was on hand to head home skipper Moses Olaleye’s delivery to make it 2-0 just after coming on. Silvestri then picked up a yellow card and had to replaced by Taishan Griffith after sustaining an injury moments later, but AFC had done enough. Boss Steve Heath said: “I was a little concerned as Hertford are a good outfit. “It showed their strength in depth, as they had a few influential players out but still caused us problems in the first half. On Saturday all top six teams face each other as AFC travel to third placed Harefield United, leaders Kings Langley make the trip to Sun Sports who are fourth, while fifth and sixth Berkhamsted and Hertford Town play at Broadwater. AFC: Porcelli. Bishop. Carney. Fryer. Cashman. Mills. Cooper. Bufano. Hall. Olaleye. Simpson (Silvestri 70, Griffith 78). Subs not used: Francis. Hartley.